This section offers recommendations for ways in which you can adapt your business to engage with youth travellers, tips to develop your own business strategy and local examples to inspire. The business opportunities and how to make the most of them are based on recommendations and findings from research into the potential for a youth travel market in the Loch Lomond area, carried out by Marketing Works, University of Strathclyde (2017-2018), commissioned by Love Loch Lomond. The project was facilitated by Interface. Header image courtesy VisitScotland Digital Media Library. Capitalise on the Loch Lomond area’s natural assets such as scenery, wildlife, nature and opportunities for eco-tourism, outdoors activities such as walking, cycling, watersports etc. Understand how and where your products and services can fit into developing authentic experiences for youth travellers. Communicate visually - focus on visuals and video in your digital content to highlight relaxation, outdoor activities and similar in marketing materials for youth travellers but ensure that they accurately reflect the business/product/destination and are not just generic “photoshopped brochure images” which can really turn savvy youth travellers off. Offer authentic experiences for youth travellers which allow your business to enhance and celebrate the uniqueness of the Loch Lomond area, and allow travellers to experience them in unique and memorable ways, such as making positive impacts on the local environment or engaging with local people. Provide a high quality experience for mobile users on all platforms and devices. Depending on how youth travellers communicate with you, consider offering Whatsapp, messaging via social platforms or dedicated apps for engagement. Be authentic in digital communications and marketing. Consider the most authentic ways to communicate what makes for a Loch Lomond escape, getting away from it all, a peaceful retreat for youth travellers and their tribes (friends, family). Develop distinctive marketing campaigns for different seasons and communicate what customers can realistically enjoy in each, for example in Spring, Summer, Autumn, Winter. Be realistic about the weather and offer alternative activities for when the weather is poor. Practical, useful and accurate information will be far more appreciated by travellers. Be highly targeted in your marketing and promotional activities - use the data from your website, blogs, and social channels such as Facebook Insights, Twitter and Instagram analytics to understand your customer demographics and target them carefully in digital campaigns. Experiment with paid ads and estabish what works most effectively. Tap into food and drink trends in your business activities. Highlight opportunities for sampling great food in lesser-known areas of the destination, not just the honey-pot areas. Develop and build a reputation for food and drink via festivals, activities – capitalise on opportunities for collaborative working to do so. Promote food and drink experiences to create “memorable images” of Loch Lomond in addition to outdoor and get-away-from-it-all experiences. Create genuinely attractive offers, incentives and rewards which will appeal to savvy youth travellers: incentives to encourage sharing and reviewing travel experiences via voucher offers, discounts or added value propositions. Understand youth traveller segments and use customer data to help you identify which segment is a potential target market. A deeper understanding of youth travellers is fundamental - understand your market via data that you capture – analyse it and use it to better understand this market and keep on top of needs and wants. Work with digital influencers and bloggers. Capitalise on opportunities offered by destination organisations, digital communities, industry networks. Tap into their expertise to connect with your audience and amplify your messsages - ensure you measure the results to test what works and what doesn't to inform future activities. Form relevant partnerships with other like-minded businesses and organisations already engaged with youth travellers to develop new products and services, or enhance existing ones, which may be attractive to the youth traveller. Take advantage of word of mouth recommendations from youth travellers (WOM & EWOM) and use these to your advantage - display this 'social proof' clearly across your digital channels and networks, offer youth travellers quick and easy ways to review their travel experiences with you. Create ways for youth travellers to be ambassadors for your business, positively encourage user generated content (UGC) via dedicated hashtags, contests and competitions, blogger activity. Build an online community of advocates around a niche theme. Popular online communities can be found in campervan travellers, craft beer fans, Munro-baggers, Instagrammers, mountain bikers, walkers and nature lovers - can your business find its niche to build a community? Listen to your youth traveller customers regularly and respond to their feedback. Listen via social media, surveys, questionnaires, ask for feedback and suggestions on social media and via Twitter polls, and act on the feedback your customers provide. Keep monitoring and evaluating the impacts of your business activities and adapt them as required. Mobile, social and digital activities provide customer data. Capture and analyse your customer data regularly to build insights into your customer base, to help target them more strategically in your digital marketing, and understand their needs and wants better. 1. Know your customers. Via your own customer data and intelligence, understand which precise age group, traveller profile and background you currently attract as this will help you to get your marketing messaging and channels right. It's important to understand that youth travellers are a diverse audience, including Millennials and Gen Z - where do your youth traveller customers fit in? 2. Be clear about your own product and service USP’s. Understanding your unique selling points is a good idea when engaging with this age group, and thinking about creating authentic experiences is a good place to start. Experienced-based trips and days out create compelling reasons for specific groups of people to visit (e.g. eco-tourism fans, outdoors lovers, festival goers, food fans) and are an effective way to attract travellers from more than one market and across all seasons. 3. Review your digital channels and identify learning and training needs. Most social media channels including Facebook, Instagram and Twitter offer free analytics - build up a picture of your customer demographic, review what content you have, on which channels it appears on and who is commenting on or sharing it. Get the help/training you need to solve issues and enhance your digital and mobile presence – not just for the youth traveller, but for all of your customers. 4. Ensure mobile matters – that your website and e-marketing renders correctly on all mobile platforms and that the content you are producing is accessible in bite-size chunks, providing the answers your customers are looking for. If not, get help to make the transition to mobile to stop visitors from leaving your site and going elsewhere. 5. Create compelling reasons to visit. Tell stories through the sense of place, nature, scenery, food and drink, wildlife, events and festivals. Focus on the authenticity of the experiences available, from volunteering on a local nature reserve, to food foraging and nature walks in the National Park, or connecting with locals via food, drink and festivals, or by staying in unusual places such as eco-pods. 6. Partner up with other businesses to develop new visitor experiences, and enhance products and services for youth travellers. This could be an accommodation provider offering outdoors experiences, new food and drink options or tours, youth / millennial brands that will add visibility to Loch Lomond and Scotland, e.g. student tours or niche tour operators seeking new products in the area. 7. Create attractive itineraries, trails or guided walks and cycle trails attractive to a younger audience and test them out, tweaking them with feedback from your visitors/customers and itineraries to promote to your audiences. 8. Transform opportunities to sample local food and drink into authentic experiences in your products and services where you can. This means co-operating with neighbouring businesses, building local partnerships, being open to new cross-selling opportunities. 9. Listen to your visitors and leverage word of mouth recommendations – share as widely as possible via social channels. Give your customers opportunities to share their experiences with you on the channels where they socialise. Or build your own communities of advocates via dedicated hashtags, stories, video and great visuals. 10. Stay active in your business community – keep up to date by talking to other businesses, networking, subscribing to industry networks and newsletters, sharing information, learning about how visitor trends impact on your area, and be ready to capitalise on opportunities to develop new markets. Read the original research findings from the Business to Business perspective report below. Keep up to date with travel and tourism trends and networking opportunities by subscribing to industry newsletters from Business Loch Lomond, VisitScotland and the Scottish Tourism Alliance. Youth travellers, particularly Millennials, tend to choose to spend money on experiences rather than possessions. They seek unique experiences over generic ones, from off-the-beaten-track destinations, to adventure activities, quirky accommodation and local food. Several Loch Lomond area businesses are developing tourism products, events and authentic experiences for visitors, tapping into trends displayed by younger travellers seeking just that. Businesses are looking at personalising experiences, bringing people together to connect with locals, offering new ways for visitors to sample local food and drink, experience more unique places to stay, get the chance to connect with the local environment and make an impact, or learn a new skill or activity outdoors. Here are just a few to inspire - find more in the "More Inspiration" panels. Balmaha's Braw Weekend, a festival of food, drink and live music was held in October 2015 and October 2016, by The Oak Tree Inn. The event, on the banks of Loch Lomond was supported by Loch Lomond Trossachs National Park and Event Scotland. It was sponsored in 2016 by Glengoyne Distillery, with Central FM the official radio partner. 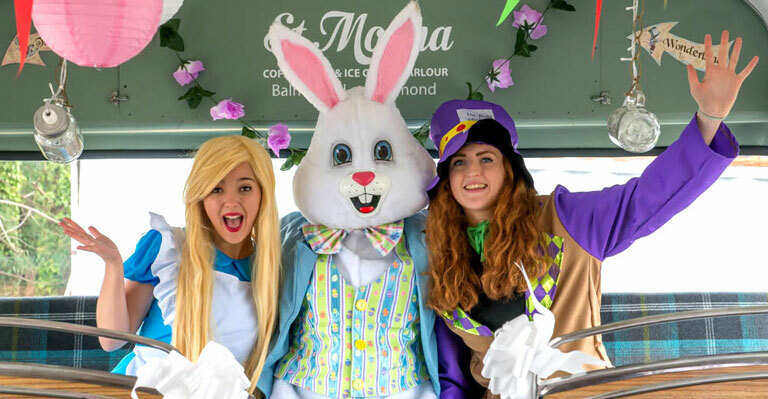 The 2015 festival coincided with the 150th anniversary of Alice In Wonderland, with a themed tea party organised on the St Mocha Coffee Shop vintage bus. Local chefs including Tom Lewis prepared a five course meal as the launch event of the 2016 festival. The festivals, staged by The Oak Tree Inn in October 2015 & 2016, attracted 5,000 people in the first year and 6,500 in the second. The event took place on a five acre green field site, on the banks of Loch Lomond and undercover in a large marquee and steel shed. In 2016, as part of the Pack More In campaign, promoting trips between Loch Lomond and Glasgow through a collaboration between People Make Glasgow, Love Loch Lomond and Scotrail, Scottish based bloggers and digital influencers were invited to attend the festival, generating further coverage in addition to social media and video. The Helensburgh Civic Centre welcomed 1,500 visitors for its first ever Street Food Sunday event in July 2018, showcasing a wide range of Argyll & Bute’s excellent local food and drink suppliers, as well as providing entertainment and activities for all ages. 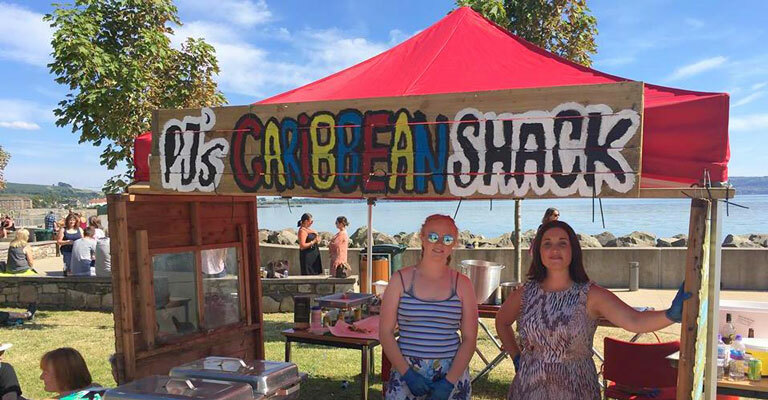 The event highlighted the growing appetite for sampling local food and drink, both from locals and visitors from further afield, in a streetfood-style event, and proved popular with a significant number of younger adults, groups, and young families. Due to the success of the 2018 event, another is planned for June 2019. Loch Lomond and Trossachs National Park has hosted the Great Scottish Swim at Balloch for five years in a row, to August 2018. 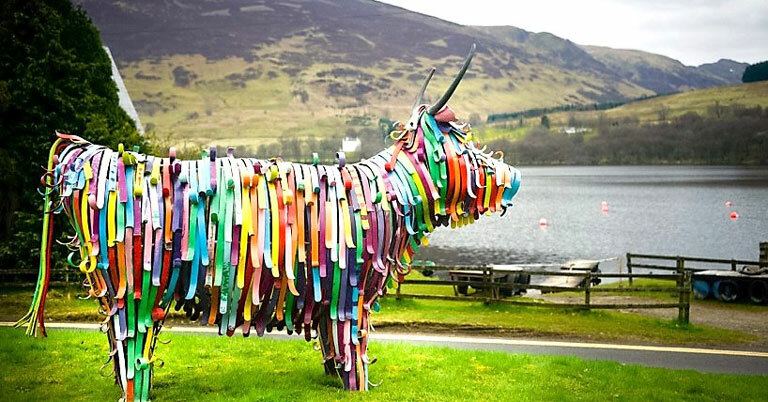 In 2017, 3000 swimmers took part, with over 50% travelling from outwith Scotland; the event generating significant economic impact for the area, including host venue Loch Lomond Shores, accommodation providers and retail outlets as well as food, drink and hospitality providers. A series of Open Water Swimming events came to Loch Lomond as part of the Glasgow 2018 European Championships and they were hailed a resounding success for the area. Organisers of the 2018 championships reported that over 500,000 people – double the projected number – attended a sports session or one of the associated cultural events. 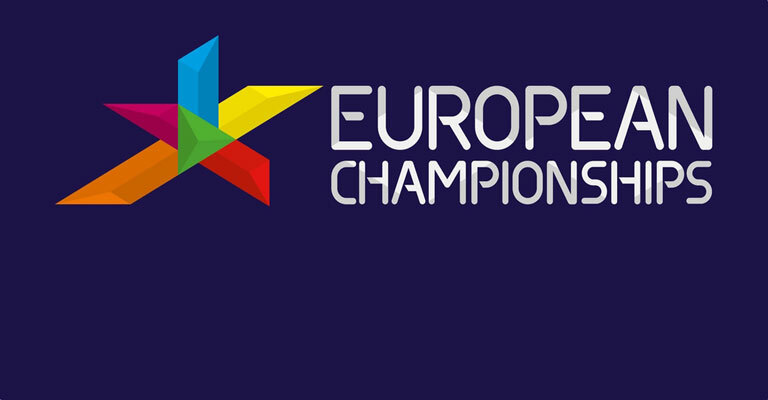 138,000 tickets were issued to spectators for sporting events such as the swimming at Tollcross, track cycling at the Sir Chris Hoy velodrome or diving at Edinburgh’s Commonwealth Pool. 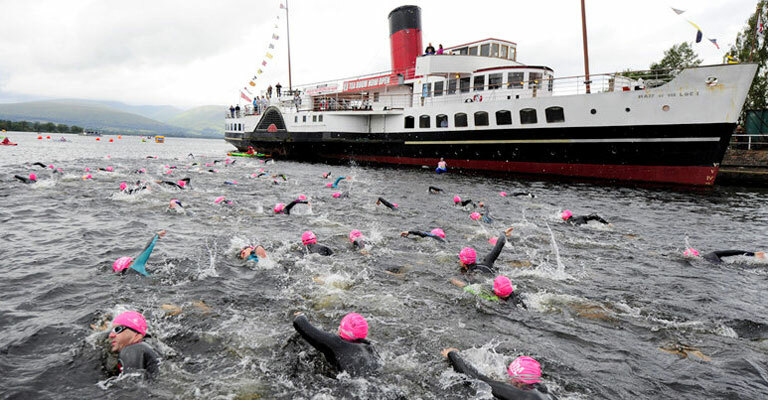 An estimated 57,000 people turned out to watch free events such as the men’s and women’s road races and cycling time trial events, mountain biking at Cathkin Braes and open water swimming at Loch Lomond & The Trossachs, organisers revealed. 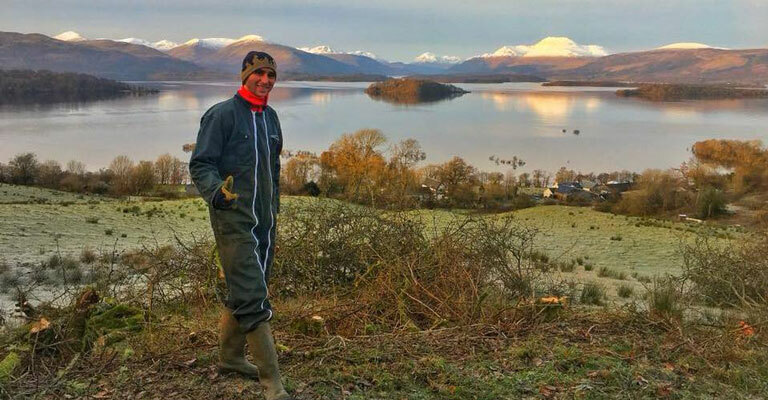 Research shows that eco-tourism is a growing trend in and around Loch Lomond. Many local businesses are offering visitors the chance to get closer to nature and enjoy concept-based accommodation experiences such as glamping and eco-pods and lodges. 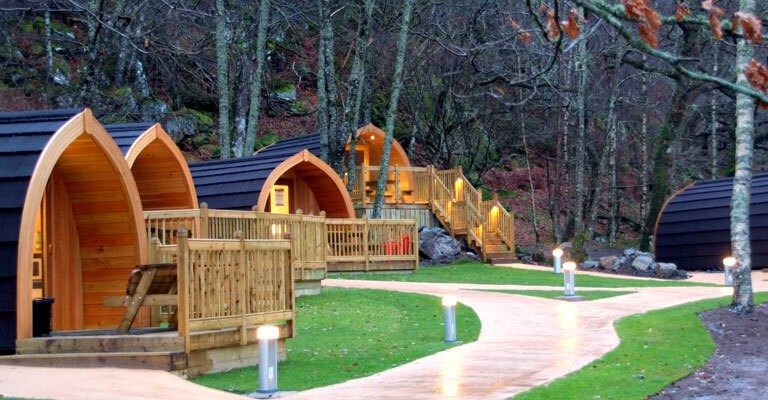 Lomond Woods Holiday Park in Balloch was one of the first in the area to offer a variety of glamping pods for visitors, the pods being very popular with couples, and small groups of friends, for just a one-night stopover or longer break. Loch Katrine Eco Lodges: The company behind Loch Katrine cruises developed a series of eco lodges onsite, some with underfloor heating and others pet-friendly, in early 2018, allowing visitors to this beautiful area the opportunity to stay, enjoy the scenery and outdoor activities including loch cruises, cycling and walking, and even some star-gazing at night! 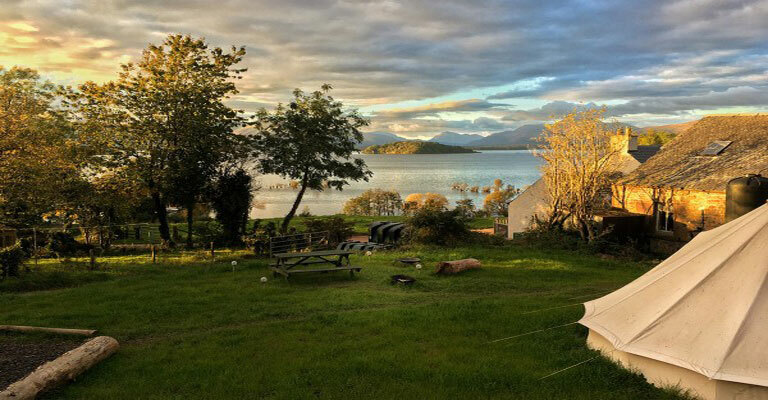 Portnellan Farm Glamping: Portnellan is a small family farm nestled on the secluded south-eastern shore of Loch Lomond in the Loch Lomond and the Trossachs National Park. The farm produces high quality organic beef but has diversified significantly to offer a range of experiences including 4 Star holiday rental accommodation, speedboat tours and boat moorings, and stand-up paddle boarding. Guests can also stay in a glamping tent which sleeps four and offers wonderful views of Loch Lomond. 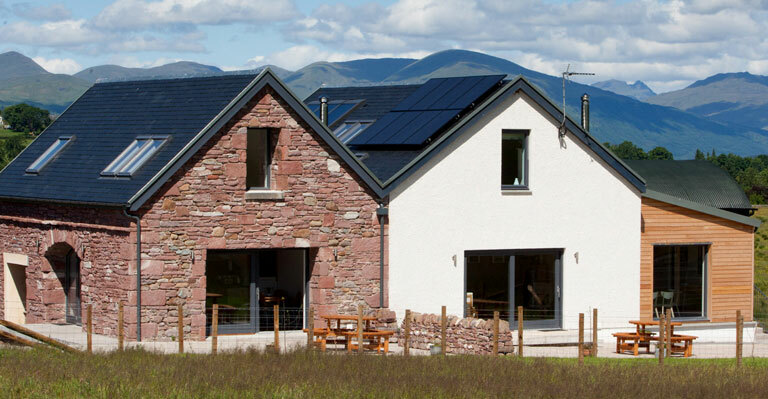 East Cambusmoon Holiday Cottages: For those arriving in electric vehicles, East Cambusmoon Holiday Cottages in Gartocharn offer free charging via 3 charge points at their farm, and in addition to EVs the owners encourage guests to explore the local stunning countryside by foot or bike straight from the doorstep, providing OS maps and walking/cycling route guides in the cottages for the local area. The Lodge on Loch Goil: Dining in a Tree House is just one of the unique experiences offered at the stunning Lodge on Loch Goil, much more than just a restaurant with rooms. Just over an hour’s drive from Glasgow, this Victorian private country house built in 1864 is one of the finest 5-star venues in Scotland, offering bespoke luxury weddings for food lovers and private dining for groups. 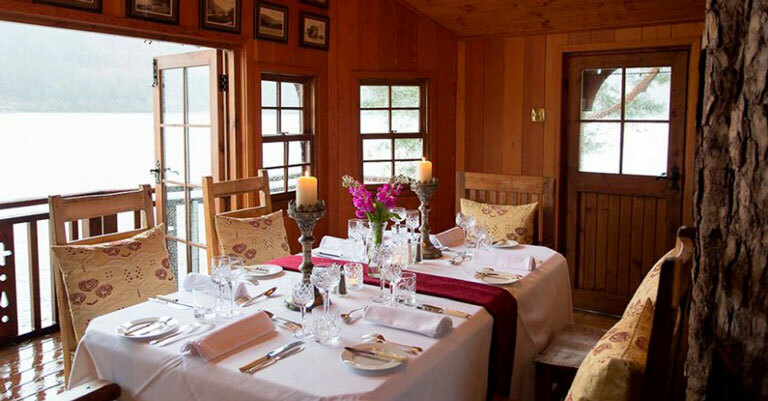 Food is locally sourced from Argyll and items also foraged from the coastline and forests surrounding the lodge. Food Foraging: In addition to regular guided nature walks and opportunities to learn about nature and wildlife, visitors to the Loch Lomond area can experience food foraging on guided walks with the local RSPB Loch Lomond Nature Reserve, to get tips on cooking from nature with ingredients such as rowan, hawthorn, rosehips, elderberries and crab apples. 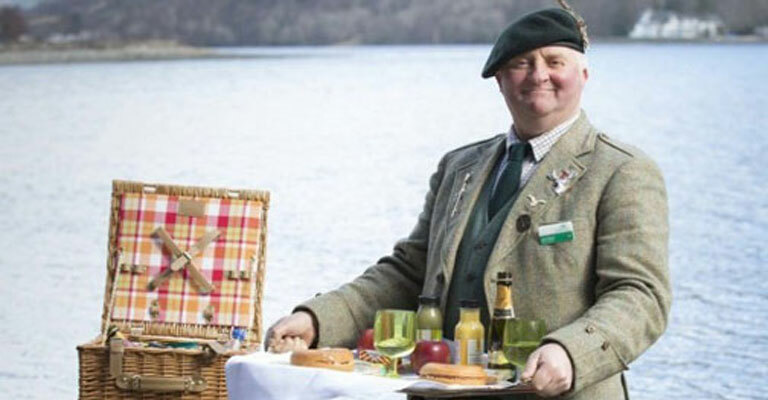 The Picnic Butler at Forest Holidays: Guests staying at the forest lodges in Argyll and Strathyre can enjoy a unique day out with your personal Picnic Butler to sample seasonal Scottish food and drink and hear stories about the people and places in the local area, from a well-versed local character! 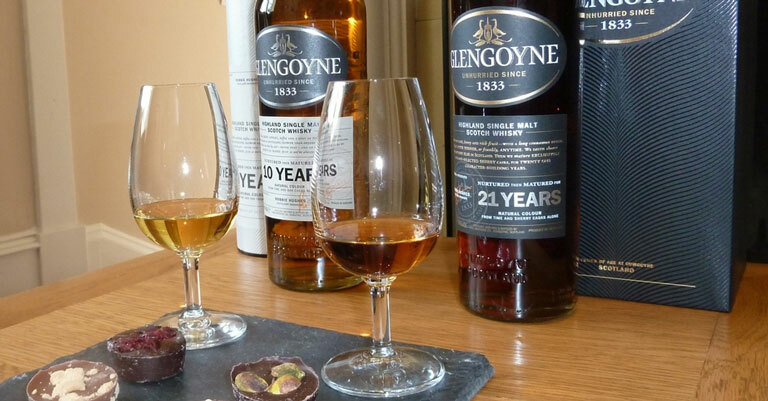 Whisky Experiences: Both local to the Loch Lomond area, Glengoyne Distillery offers visitors the chance to enjoy a whisky and chocolate matching tour and Auchentoshan Distillery allows visitors to bottle their own dram. Dine at Inver and stay in a Contemporary Bothy: Intrepid visitors keen to experience the wonders of Inver restaurant for dinner are able to stay overnight in unique, ensuite, contemporary bothies, right next to the restaurant, accessible via a small bridge - which allows them to savour wonderful loch views and feast on local specialities for breakfast - brought to your bothy in a picnic basket. Trails, guided walks and itineraries all feature strongly when it comes to customising experiences for youth travellers and allowing them to venture off the beaten track and explore for themselves. BLiSS Trail: The award-winning BLiSS trail currently offers 25 locally produced artworks and sculptures set into stunning locations across four local communities of Balquidder, Loch Earnhead, Strathyre and St.Fillans (BLiSS) in The Trossachs.The trail has also been enhanced with a new GeoTourist app and audio tour which can be downloaded to listen to descriptions of each installation, by either the artists themselves or by a local. Users will also find photos and maps of the installation locations. 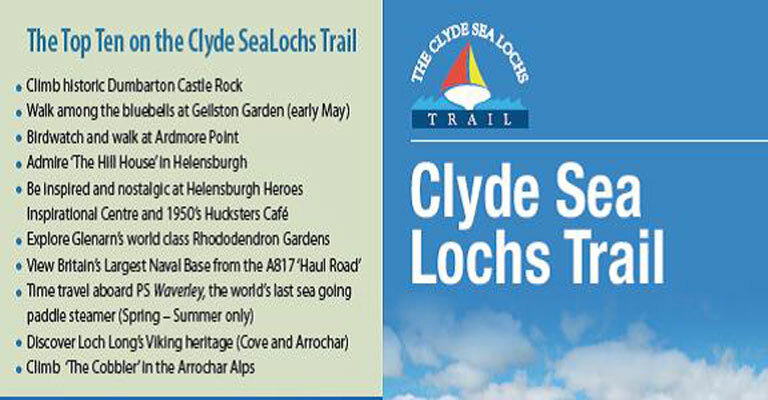 Clyde Sea Lochs Trail: The Clyde Sea Lochs Trail leads visitors on a fascinating 65 mile journey of discovery around the northern shores of the Firth of Clyde and its beautiful sea lochs. The trail has 13 descriptive panels, and can be visited by bike or by car, there is also a geocache trail directly linked to the route as an added attraction. Journeys to specific parts of the route can also be made by public transport. In Your Element offers bespoke group guided experiences all year, from 1 hour to half-days or longer sessions. Activities include canoeing river sledging, gorge walking, canyoning, mountain biking, hiking, archery, paddle boarding, segways and Treezone aerial adventure courses in Loch Lomond and Aviemore. In Your Element also offers group activities such as Highland Games, land and water treasure hunts, orienteering challenges and more tailor-made team building experiences. 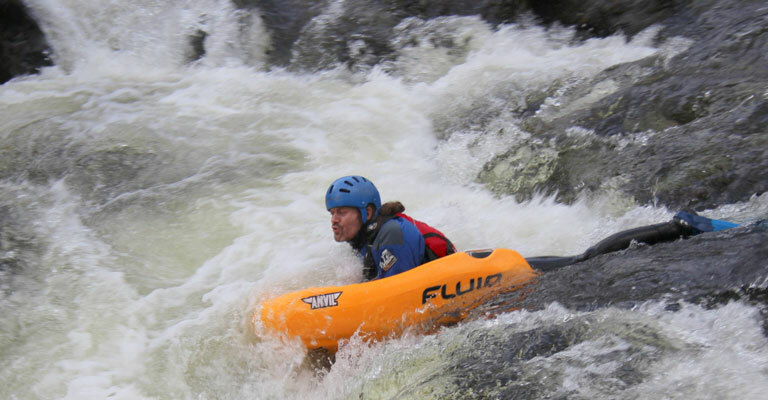 The company has partnered with a number of accommodation providers seeking to offer unique outdoors experiences for their guests - these include Luss Estates, the Loch Lomond Arms Hotel and Inverbeg Holiday Park; where they are now offering archery, river sledging, canyoning, gorge scrambling, canoe trips and more for their guests. In Your Element also provide outdoor activities at Loch Lomond Shores, offering bike and boat hire and guided outdoor activities, and are the outdoor activity provider for Forest Holidays at Ardgartan and Strathyre. Portnellan Farm has been hosting volunteers for 5 years through WWOOF, which stands for World Wide Opportunities on Organic Farms. WWOOFers work on organic farms or estates or gardens as volunteers, in return for their board and lodging. WWOOFers stay with the family and learn about welfare-friendly, organic beef production in a stunning Scottish setting. They often help with the moorings in Portnellan Bay and changeovers in the Old Farmhouse, 4-Star self-catering accommodation and glamping tent. Portnellan has hosted 120 WWOOFers to date, for periods from 2 weeks to 3 months, with the youngest 18 years and the oldest over 50. WWOOFers come from across the world – 18 countries to date. France has provided the most at 34, followed by 25 from Germany; 20 from USA and 13 from the UK. The farm has had one South Korean, one Moroccan, and boys from South Africa, Australia and Hungary. Portnellan also hosts vet students on the farm; usually from British universities where they need practical experience on farms in their pre-clinical years. Some vet students come through the WWOOF scheme, which also works well. Other volunteering opportunities are available at the RSPB Loch Lomond Reserve and via the Loch Lomond and the Trossachs National Park which launched a Young Person’s Volunteering Programme in recognition of the Year of Young People 2018. Conservation charity Friends of Loch Lomond and The Trossachs also organises regular Make a Difference Days which recruit volunteers. The passionate team at Amazing Days has been creating unique, bespoke corporate events, team building days and experiences for corporate groups visiting Scotland since 2006. It recently opened up its Loch Lomond 4x4 Adventures to private leisure customers. The company is a specialist in building experiences around Loch Lomond and its islands.The 007 Skyfall Loch Lomond has become one of its most popular challenges including 4x4’s, speedboats (April - September), Bond girls, international crime lords and hilltop Vodka! Bring youth travellers together! Youth travellers, particularly Millennials, seek human interaction. Helping them to immerse themselves in local culture will help them feel emotionally connected to the local community. Creating events around food and drink, music or arts and crafts are an ideal way to do this.